Brooklyn Nine-Nine isn't going anywhere in the new fall season, after having already been canceled once. Fox dropped the show after its fifth season. But NBC swooped in and saved it. And they've found much success with the wayward cult comedy. Now, it will be getting a 7th season on the Peacock network. 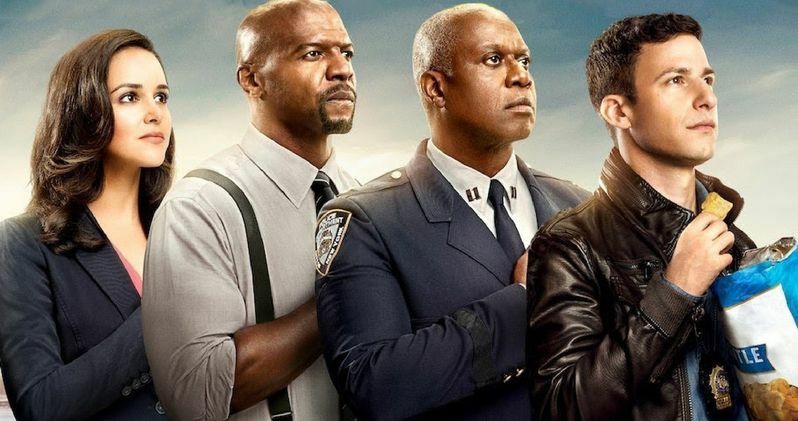 NBC has renewed its critically acclaimed comedy Brooklyn Nine-Nine for the 2019-20 season. This will mark the second season of Brooklyn Nine-Nine on NBC and the seventh season the series has been on the air. So far this season Brooklyn Nine-Nine has averaged a 1.4 rating in adults 18-49 and 3.9 million viewers overall in "live plus seven day" Nielsens, an increase of 8% in 18-49 rating and 34% or 1.0 million persons in total viewers versus its average at this point last season on Fox (1.3 in 18-49, 2.9 million viewers). Brooklyn Nine-Nine is one of the strongest digital performers on the NBC schedule, deriving 45% of its "live plus seven day plus digital" rating in adults 18-49 from non-linear sources, the highest percentage among NBC shows. Said Lisa Katz and Tracey Pakosta, Co-Presidents of Scripted Programming, NBC Entertainment. "It's been one of our great joys as a network to give 'Brooklyn Nine-Nine' a second life. Cheers to Dan Goor, Mike Schur, Luke Del Tredici and David Miner, and our amazing cast and crew who each week turn New York's finest into New York's funniest." Critics have raved since the show's NBC launch on Jan. 10. USA Today calls Brooklyn Nine-Nine, "one of the most reliably funny sitcoms on TV," the Hollywood Reporter said the series came to NBC "without missing a beat" and Entertainment Weekly said the show has a "joyous, goofball energy." Dan Goor, Michael Schur, Luke Del Tredici and David Miner are executive producers. Brooklyn Nine-Nine is produced by Universal Television, Fremulon, Dr. Goor Productions and 3 Arts Entertainment. This news was delivered direct from NBC.